Suffragette. Classic treatment of an important subject matter. 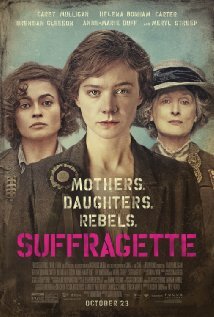 Starting in 1912 and set in England the film shows the increasingly more violent struggle of the so-called women’s suffrage movement (the fight to obtain the right to vote for women and in more general terms to be considered and treated as equal). Sarah Gavron’s (Brick Lane, 2007) ‘Suffragette’ is one of those typical films about an historically important subject matter that receives the classical BBC treatment (even though they were not envolved in the production). The costume and production design are spotless, the script neatly checks off all the important historical events it needs to include but in the end you have the feeling that the subject matter deserved a better film. And so do the actors which are all impeccable in the best British tradition. Carey Mulligan, Helena Bonham Carter, Anne-Marie Duff and the omnipresent Ben Whishaw (The Lobster, Spectre and the upcoming The Danish Girl) to name just a few are all outstanding. In the above poster you’ll notice that Meryl Streep is prominently featured which is extremely misleading as she only has a brief appearence in the film as the real life historical figure Emmeline Pankhurts, the leader of the British suffragette movement. In the early stages of the film she can be seen in a photograph while the camera pans across a wall, but she actually only has one scene where she gives a speech on a balcony, and that’s it. If Meryl Streep receives an Oscar nomination for best supporting actress for this extremely brief appearence I would seriously suspect ‘electoral fraud’. Also typical for this type of film is that during the end credits you get to see real historical footage and some additional historical facts that makes you wish you’d seen a documentary on the subject instead. It shows a list of countries and the year in which women received the right to vote, ending with Saudi Arabia where … let’s say the struggle is still continuing. As Belgium did not feature in the list I’d just like to conclude by stating that in our country women received the right to vote (and to be elected) in 1948 (30 years later than the characters in Suffragette) and they were able to exercise that right for the first time in 1949 when the first general election was held after their right to vote was obtained. < Previous Les Croix de Bois. (Wooden Crosses) The WW I trenches as seen by Raymond Bernard.